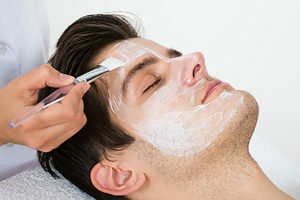 Men’s Treatments are growing ever more popular and we welcome men to The Beauty Rooms. For our gentlemen clients we offer Waxing, Facial Treatments and Massage. The most popular of our Men’s Treatments is the Back Wax. However we would only recommend this if there is a small/sporadic area of hair as chest hair is usually coarse and deep rooted. Regular waxing will result in finer, lighter, re-growth and can take anything between 2-8 weeks before further treatment is required. The Dermalogica Unisex and Speciality Shave range has a solution for shaving bumps, irritation, ageing or breakouts. An initial consultation will allow us to recommend the best Facial treatment for your skin concerns. Facial Treatment consists of a deep cleanse, exfoliation, extraction, pressure point massage and a soothing/hydrating mask. Please click here to view our full range of Facial Treatments. Please click here to see our full range of Massage Treatments.